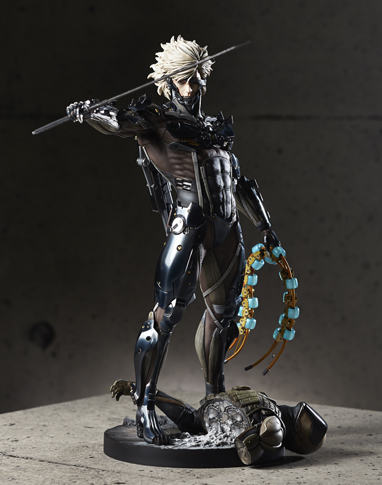 This perfectly recreated heroic statue features RAIDEN standing triumphantly holding a "SELF REPAIR UNIT" extracted ("ZANDATSU KILL") from the enemy cyborg soldier in his left hand, and gripping his HF blade tightly in his right fist. The well balanced and powerfully muscular body was carefully designed by sculptor Shinya Akao, and the highly detailed mechanical designs of the weapons and overlapping armor were digitally sculpted by his younger brother, Masaki. The eye glows red with a powerful and bright LED. The closed visor for battle mode is available with optional parts. The "HF MURASAMA BLADE" is interchangeable in his right hand, and the scabbard in his left hand.